You have 4 categories of filters that you can add. Each of these categories can be further refined by either selecting or deselecting specific filter parameters or by the user typing a filter string in the field provided. 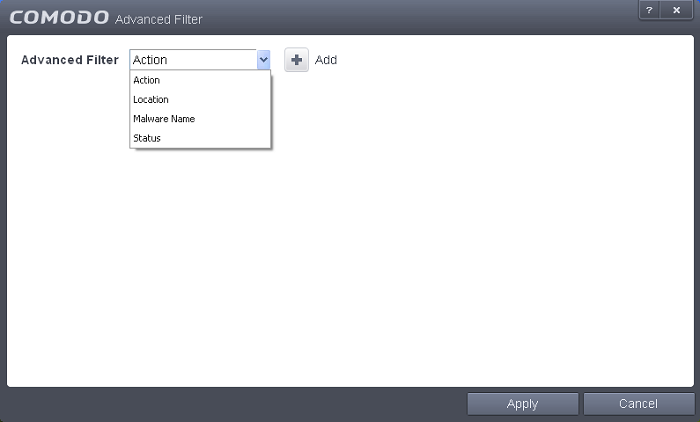 You can add and configure any number of filters in the 'Advanced Filter' dialog. Action: The 'Action' option allows you to filter the entries based on the actions taken by CIS against the detected threat.Selecting the 'Action' option displays a drop down field and a set of specific filter parameters that can be selected or deselected. Select 'Equal' or 'Not Equal' option from the drop down. 'Not Equal' will invert your selected choice. 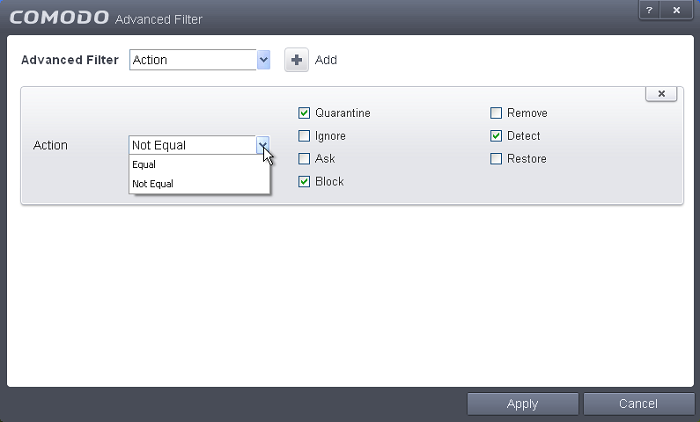 For example, if you checked the 'Quarantine' box then selected 'Not Equal', you would see only those Events where the Quarantine Action was not selected at the virus notification alert. Location: The 'Location' option enables you to filter the log entries related to events logged from a specific location. Selecting the 'Location' option displays a drop-down field and text entry field. Select 'Contains' or 'Does Not Contain' option from the drop-down field. For example, if you select 'Contains' option from the drop-down field and enter the phrase 'C:\Samples\' in the text field, then all events containing the entry 'C:\Samples\' in the Location field will be displayed. If you select 'Does Not Contain' option from the drop-down field and enter the phrase 'C:\Samples\' in the text field, then all events that do not have the entry 'C:\Samples\' will be displayed. Malware Name: The 'Malware Name' option enables you to filter the log entries related to specific malware. Selecting the 'Malware Name' option displays a drop-down field and text entry field. Enter the text in the name of the malware that needs to be filtered. For example, if you select 'Contains' option from the drop-down field and enter the phrase 'bluto-force' in the text field, then all events containing the entry 'bluto-force' in the Malware Name field will be displayed. If you select 'Does Not Contain' option from the drop-down field and enter the phrase 'bluto-force' in the text field, then all events that do not have the entry 'bluto-force' in the 'Malware Name' field will be displayed. Status: The 'Status' option allows you to filter the log entries based on the success or failure of the action taken against the threat by CIS. Selecting the 'Status' option displays a drop-down field and a set of specific filter parameters that can be selected or deselected. Select 'Equal' or 'Not Equal' option from the drop-down field. 'Not Equal' will invert your selected choice. Click 'Apply' for the filters to be applied to the Antivirus log viewer. 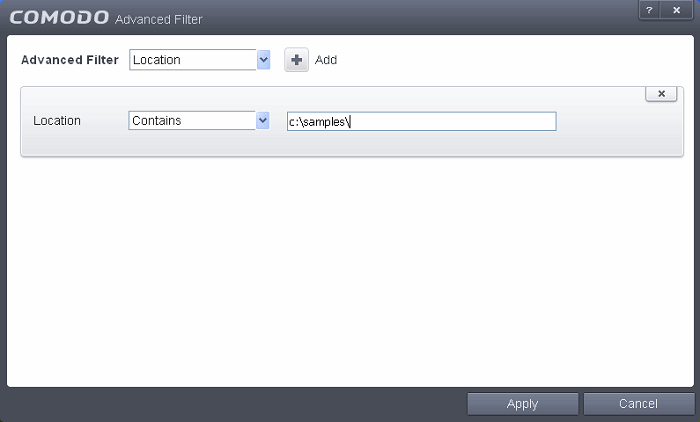 Only those entries selected based on your set filter criteria will be displayed in the log viewer.